We’re exceptionally pleased to host a guest blog from Maurice Nevile (University of Southern Denmark), who tracked down and listed every single article published in ROLSI between 1987 and 2014. Here is his account of how he did it. Did Harvey Sacks ever publish in ROLSI? Which studies examine repair? Do any ROLSI papers investigate interactional phenomena of German? A complete chronological bibliography for ROLSI (from 1987) now makes it easier to search within the journal for particular authors, analytic interests and phenomena, settings and forms of data, languages, or whatever. I initially compiled the bibliography to support a review study on embodiment, and then developed it for wider public use. Every item is listed with full citation details, and web address for access via the publisher’s website. It was a slow process, collecting details from the journal’s online year-by-year records. I corrected the occasional error such as in spelling, or authors listed in reverse order, and tracked down missing information. A special challenge was restoring detail of diacritics, lost from the original texts, for non-English words (very often names). I maintained the journal’s practice of using full names (with family name last), but revised to ensure consistent formatting and capitalisation. Mostly I used the journal’s own headings, but indicated special issues and sections/debates more clearly, and also list these separately. 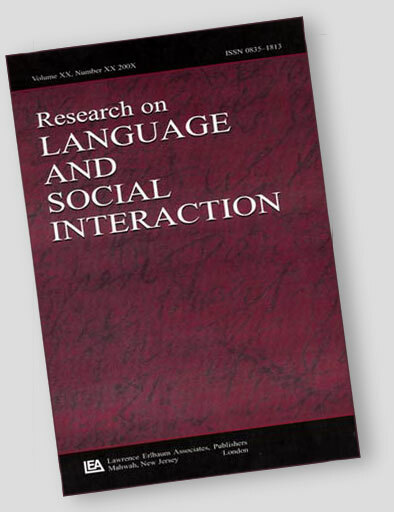 While gradually building an overview of over 25 years of interaction studies, it was a treat to see the vast range of interests and settings covered, speed dating and long-standing relationships, political debate and gossip, compliments and insults, greeting and leave taking, laughter and crying, children learning language and the elderly adjusting to hearing loss. I was surprised or reminded of papers examining acupuncture, graffiti, music rehearsal, conscientious objection, secrets, manipulation of self, artificial intelligence, quantification, post natal depression, fine art photography, Old Order Amish, salutes, evolutionary theory, stand up comedy, town meetings, Garfinkel, airline compassion fares, and talking to dogs. An overview of the full publishing history of the journal is valuable for capturing the development and changing character of the field, including its shifting preoccupations and terminology. At least from evidence of paper titles, we can see the disappearance of ‘back channel’, ‘politeness’, and ‘rule’, but the appearance of ‘gesture’, ‘embody’, ‘multimodality’, ‘participation’, and ‘epistemics’. We can track the gradual disappearance but then recent re-appearance of ‘ethnography’, and the interest varying from the sensitivity and accomplishment of ‘face’ to the physicality and visibility of ‘facial display’ and ‘facial expression’. Or, we might note the four investigations of ‘classroom interaction’, while recognising also studies of other forms of learning, instruction, and collaboration, including a high school physics lab, a music rehearsal, a master vocal class, and even a CA data session. Alternatively, we can more easily find possible absences. For example, while studies of gaze are readily apparent, studies specifically of pointing are less so. Yes, Sacks has published in ROLSI, in 1988 with ‘On members’ measurement systems’. At least twelve papers deal substantially with repair, the first in 2003 and including some within a special issue in 2012. And five papers have a prominent focus on phenomena of German, though twice as many deal with Japanese. I hope the bibliography will help colleagues to make searches and discoveries of their own, perhaps track down an elusive text, or find a starting point for deeper digging, either in ROLSI or beyond. The bibliography is available here.